The Joint Apprenticeship & Training Committee offers a complete 5-year program incorporating on-the-job training and supplemental classroom related instruction for the Inside Electrical Wireman Program, and continues to accept applications from eligible applicants in accordance with its approved standards and selection procedure. 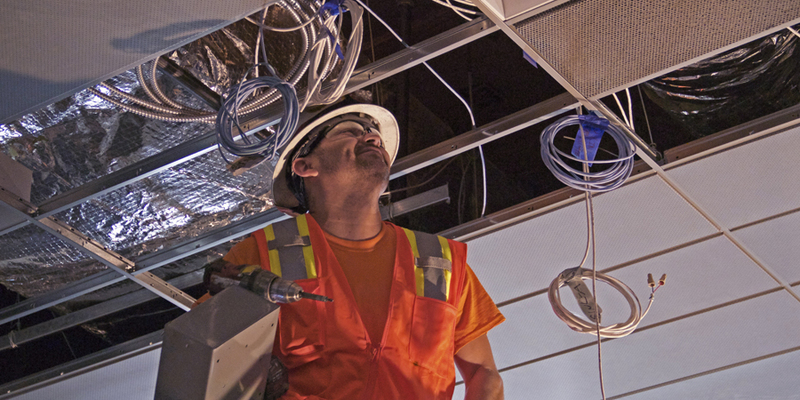 The Inside Electrical Construction Trade requires physical effort on the part of the apprentice to accomplish ladder and scaffold climbing, pulling, pushing, crawling, crouching, working in cramped and confined quarters, and lifting 25 to 50 pound objects on a fairly constant schedule. The individual must possess the ability to understand written and spoken English, and to closely follow specific instructions, especially safety directions. Inside Wiremen use many and varied hand and power-assisted tools to install conduit, wiring, fixtures, devices, and electrical apparatus within commercial, industrial and residential buildings.